I love answering readers’ questions, and one of them I get from time to time is what poses to do for some pre-run yoga. They might have searched my website or YouTube channel and noticed that I don’t have any recommendations or sequences for pre-run yoga. But there’s a reason for that—I actually don’t recommend pre-run yoga. Someone who is just a yoga teacher, or even a yoga teacher who enjoys running, could easily recommend yoga to loosen things up before a run. Heck, they might even give you a sequence to follow. “Your hamstrings get tight when you run? Hold Gorilla pose for 30 seconds a couple of times before you run and you’ll be good to go!” They figure that yoga is perfect any time of day, in any situation, because it really is beneficial in so many ways. The problem is, yoga poses are static stretches. That means that you hold them for a few seconds to a few minutes, letting your body really sink into the pose. Your muscles, tendons, and ligaments start to open, and if you stay there long enough, your fascia may start to loosen, too. Ask a running coach and she’ll likely tell you that you should avoid static stretches before you run. Dynamic stretches, or moves that help lengthen and open your body while moving, are awesome to do before a run. These would include moves like leg swings, high knees, and so on. But, in these stretches, you’ll notice that your body is always in motion. 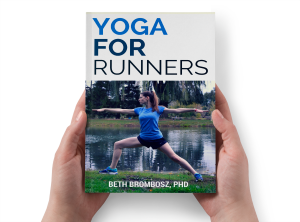 Dr. Beth loves to make recommendations based on science, so I’m really glad that sports scientists have conducted studies to see what types of stretching are best for runners and other athletes. That body of research generally shows that static stretching before running can decrease your running performance. You can lose some of that spring in your step, which definitely can make you slower. It could also make your legs get tired faster or make you work harder to run at the same pace. Young and Behm found that static stretching reduced explosive force. That explosive force is what your legs use every time they rebound from the pavement to take another step. So, if you do static stretching before a run, your legs could feel more sluggish than they would have if you’d avoided those static stretches. Nelson and colleages found that when sprinters stretched before running, it significantly (statistically) increased their 20 m sprint times. So, if you’re going to be doing speed work, or even if you’re going to be running a shorter race like a 1 mile or a 5K, I’d definitely recommend avoiding static stretches. Longer distance runners, you’re not safe, either. Wilson and colleagues ran a study that tested the effects of pre-run static stretching on VO2 Max (essentially a measure of how hard you’re running in this instance) in endurance runners. They too found that static stretching is detrimental to running performance. The endurance runners had to work harder and use more energy to run after doing static stretches. So Should Runners Avoid Static Stretching? This is great info! I find doing a yoga class the day before a long run or later in the day after my run is best for me. I am so bad at doing dynamic stretches before running but I know they would help. Thanks for the yoga tips! I tend to do a few yoga moves as stretches after my run. Before my run I usually do a 5 minute walk. During that walk I do some knee lifts, kicks, etc, but nothing for a deep stretch. 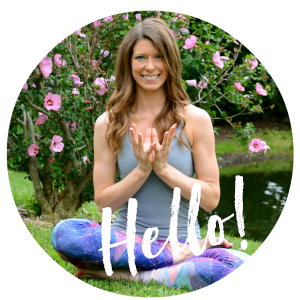 I had often wondered if I should be doing more yoga type stretches before the run but this post answered my question – thanks! 100% agree. I actually don’t do anything before I run. I just start out slowly and let everything loosen up. Very good point – I like doing my dynamic moves before a run. Save the static stretches for once I’m done! This is a question I get anytime I talk to a new group of runners, “aren’t we going to stretch?” Noooooooo. Hahaha. Something else I learned when taking my coaching cert is that stretching when too warm (say, after a long run) isn’t recommended because everything is too lose and can over stretch. I save the static stretches for afterwards…and try to do some dynamic moves to get the blood flowing and the muscles warmed up. Thankfully I’ve never heard a yoga teacher tell anyone to do yoga pre-run… but I have seen it posted online! I still have a lot of clients who think static stretching is the way to go before a run. Thankfully they are all newer runners and easy to correct.